I didn't know about CliffsNotes until high school, and that was in the late nineties, so I'm a bit perplexed that Adam knew about them in the 80s when he was in junior high. His curiosity/fear of kissing is probably about at the right age, though, so I'll give him that, although Barry and Erica were definitely trying to make him more mature than he needs to be. Taking away his toys and giving him cologne? Seriously? 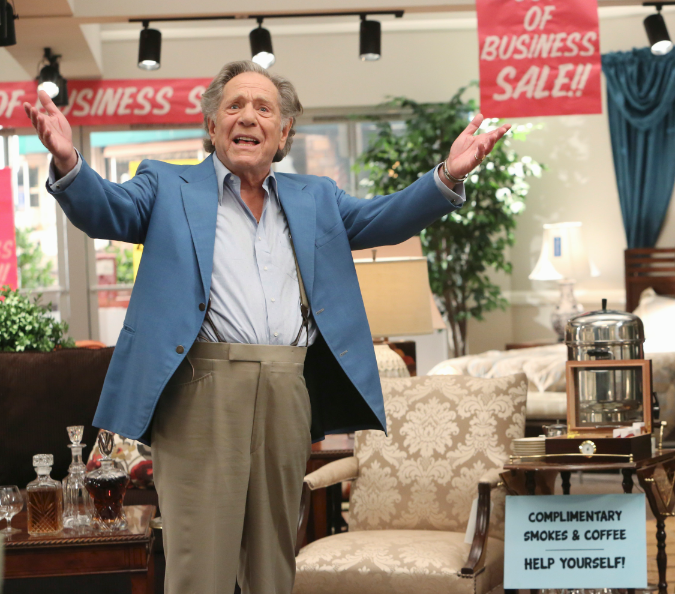 Similarly, Pops doesn't want to be pushed into hanging out at senior centers and being a snowbird, and although he's been retired for some time, his continued stake in the furniture business makes him feel young... at least young enough to still be working! The parallel between the senior citizen and the adolescent was an interesting one, though not the show's best angle so far. Episodes like this one make me question whether the show will live for a second season. Jenkintown 46, PA" with a phone number of JK5-0175. The Goldbergs "You're Under Foot" (S01E10): Pops' friends have all headed to Florida for the winter, and when his constant presence drives Bev crazy, she asks Murray to take him to the furniture store for the day. [haha, he wanted to troll for a scalper to get Billy Joel tickets!] Murray practically has to drag in the man, but once he's there, he has a lot to say about how business is being run, and wants to make a lot of changes. Pops keeps coming to the store all week, and starts doing gimmicky sales and wanting to run an old commercial. Murray fights it, as it is rather misogynist, but Pops points out that he still owns 51% of the company. The man does decide to shoot a new commercial, complete with a straight jacket, before eventually giving in and letting Murray run the store. [I thought how he handed over 2% was cute.] Murray agrees to let Pops come in more, and does finish the commercial. The other storyline of the episode revolves around Adam, who has a crush on Dana. When he offers her his CliffsNotes for To Kill a Mockingbird, he tries to impress her with his toys from Transformers, He-Man, and G. I. Joe. When she runs out, he asks his siblings for advice, but they tell him to lose the toys. Sad, he packs them up and brings them over to Dana's younger brother, but later learns that Dana wasn't turned off by his toys, she was just afraid to kiss him. [wow, does that ever bring back memories...] All's well, though, when Beverly collects the toys back for her youngest son.